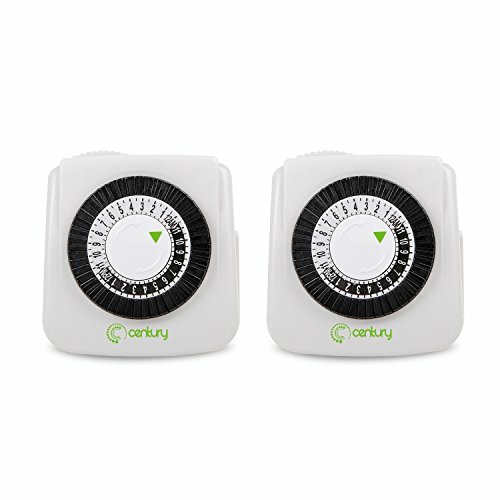 Century Mini Indoor 24-Hour Mechanical Outlet Timer with 2 Prong turns indoor lighting on and off at set times. Package includes 2 mini timers that can be used in two locations, which will give your home that lived in look while you're away. This plug-in timer provides up to 48 on/off settings per day and the cycle repeats every 24 hours. Easy to set in 30 minute intervals with segment pins that can easy push down or up. Use the manual override button to turn the timer on or outlet on, so you don't have to delete any preprogrammed settings. The compact design fits the bottom outlet without blocking outlet above. Plug fans, lamps or holiday lights in and set the timer to turn the device on and off so it won't remain on when unused. This Timer provides the safety and security as you come home to a lighted house. No fumbling for the light switch or tripping over obstacles in your way, the lights are on when you walk in the door. This timer is compatible with compact fluorescent lighting, LED bulbs. The Century Timer bring simplicity to your life, by maximizing convenience, security and energy savings.